Wednesday 9 September opens with the same programmes as yesterday, diverting at 5pm to Granada’s Zoo Time. 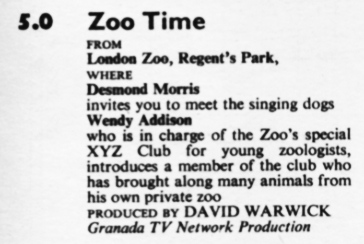 This programme featured Desmond Morris at one of the UK’s main zoos – London, Whipsnade and Chester. These were the days when zoos were mainly museums for showing live animals. The animals themselves were in small cages and a day out to the zoo simply involved going to see unhappy creatures in too small a confined space watching the visitors mournfully. 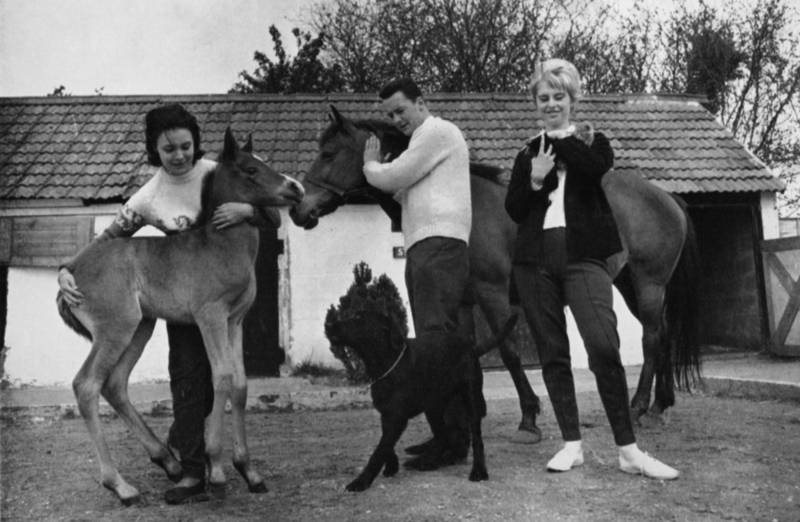 This would change as time passed, partially because of programmes like Zoo Time being compared by viewers to Anglia’s Survival series, which showed animals in their natural habitats. As people started to find the idea of zoos-as-museums bothersome, the cages were broken out into enclosures, with much more natural environments and more space, and the zoos themselves started to specialised in endangered species and breeding in captivity, rehabilitating their image. Desmond Morris is a zoologist who turned his scientific eye on human beings, studying our behaviour in the same way he studied animal behaviour, and used Zoo Time to specifically draw comparisons and note similarities between non-human and human animals, particularly spotting the large overlap in sociobiological behaviour between humans and other primates. The series also brought on a different expert in each episode to talk about some aspect of zoo life or biology; this week Morris talks to the head of London Zoo’s young zoologist club and brings on a child, Richard Claypole, from Mill Hill in London who has his own menagerie at home with 120 animals. Fred Dinenage is back at 5.25 for Three Go Round, yet another hipper take on Blue Peter. The TVTimes calls this a Southern Network Production, differing from the usual plain Southern Production, yet this is not networked: Rediffusion fills the slot with Yogi Bear & Friends, an edited together string of older cartoons from Yogi, Snagglepuss and Yakky Doodle Duck. This is therefore possibly another major-minor programme swap, liable to go out on Anglia, TWW and STV as well. Rediffusion extends the Ready Steady Go! brand into Ready Steady – Win! at 6.40 on Southern. 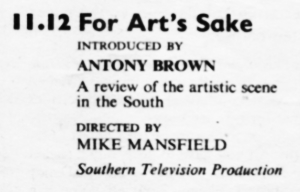 This was a time shift for Southern, as it had shown on Monday on Rediffusion. This change displaces Granada’s otherwise networked Criss Cross Quiz, which doesn’t get a Southern time shift and is just dropped, although Southern do carry the Junior version later in the week. There’s a general election due this year – the last one having been held in 1959 – and although it hasn’t been called yet, the parties know this and are making full use of their allotted Party Political Broadcasts. At this time these are still 15 minutes long, and have a television monopoly: they’re on BBC-1, BBC-2 and all ITV companies at the same time. 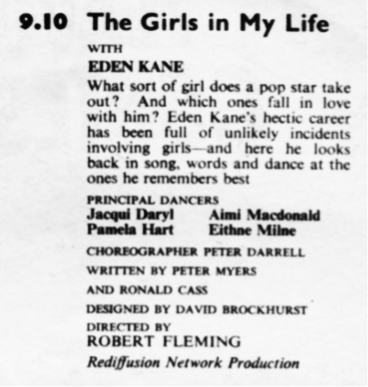 The BBC’s policy is to run programmes 15 minutes late for the rest of the evening, but ITV tried to bring everything back to time, and the 9.10pm The Girls in My Life, at a mere 20 minutes, seems designed purely to fill an awkward spot. Eden Kane is also known as Richard Sarstedt, older brother to Peter and Robin. You may not know him, but if you’ve ever watched the 1990s Star Trek series, you’ll have seen him: he turns up in the background all the time through TNG, DS9, Voyager and Enterprise playing various miscellaneous non-speaking crew members. 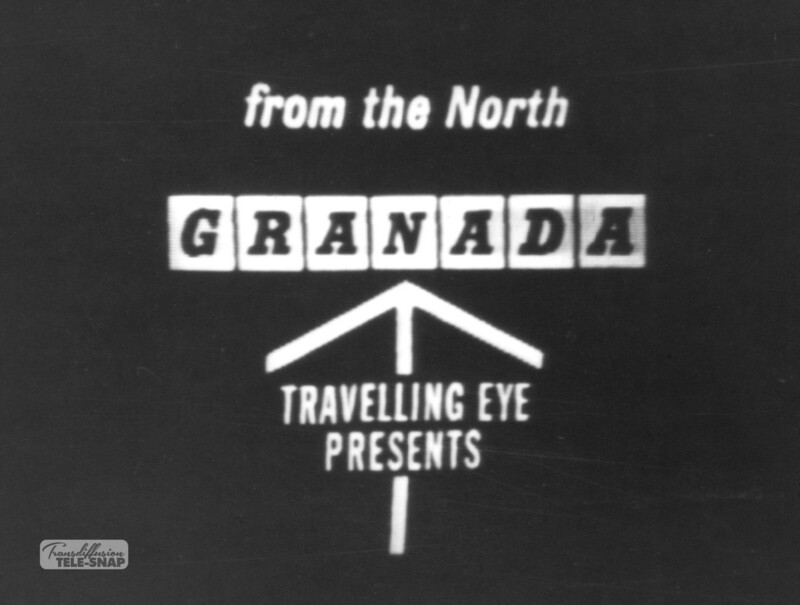 At 9.45pm it’s 45 minutes of high culture as Granada from the North goes to… London’s West End to take in a popular revue. It’s difficult to imagine even BBC Four today doing three quarters of an hour of two people stood by a piano singing, even if they’re singing popular standards such as Mack the Knife and It Was Never You. This is certainly material to please the Independent Television Authority, although how well it did up against East Side/West Side, a CBS drama series, over on BBC-1, and part 15 of Correlli Barnett’s history series The Great War on BBC-2 is a matter of conjecture. Notwithstanding the 15 minute Party Political Broadcast, the hourage for the week on Southern is overrunning. Therefore, some programme has to be being designated as adult education to prevent a closedown at the extraordinary early time of 11.15pm. The only contender is For Art’s Sake at 11.12pm, which gives us a 15 minute review of the arts scene in the Southern region. As ever, the definition of adult education is being stretched a bit here. Nevertheless we’re off air by 11.30pm. Rediffusion in London came on 15 minutes later than Southern and extends the day to midnight by slipping in half an hour of an ATV programme that is also pretending to be adult education – the cherishably named Edgar Lustgarten meeting people who are feeling frustrated with bureaucracy.